All About us! Since 1998, Sitters at the Shore has been providing baby sitting services to many families visiting our islands. 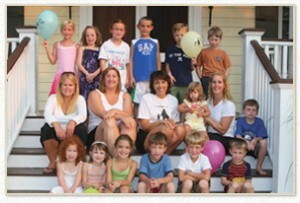 Sitters at the Shore is owned and operated by local schoolteacher, Christine Meehan. She has lived in Cape May County for the past 30 years and has been known as the matchmaker for families looking for the perfect sitter since 1998. Every parent wants a calm, positive and engaged caregiver as their sitter. We seek out teachers and experience childcare providers. We personally interview each candidate, running background and reference checks so you can be confident in our sitter referral process. Our sitters range in age from 18 to 70 years old, they are fully screened and background-checked by our agency. They are nurturing, caring, responsible sitters who enjoy playing, laughing, entertaining, and caring for the young and old. The majority of sitters are present or former teachers, aides, substitutes or college students majoring in education or other related fields. 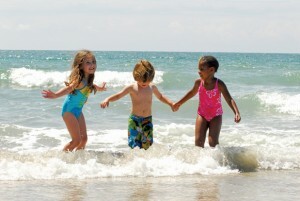 -Sitters at the Shore will work for you to find you the perfect sitter. -When we make our placement, we will give you a brief description about the professionally screened, referenced and background-checked sitter who can assist you and your family. -The sitter will call you to introduce herself and to confirm your dates, times and location. -Sitters can be identified by their t-shirt and will bring along a goodie bag and sitting forms. -Before you leave our sitter in charge, we ask you to take some time to fill out our Sitters Instruction Guide Sheet so our sitters can follow your detailed instructions to care for your children! Note: Special sitters for special needs children are available upon request. Where do the sitters go and what areas do they service? We are; Cape May Sitters, Wildwood Sitters, 7 Mile Sitters, Ocean City Sitters and Atlantic City Sitters. We cover the shore towns and go to your private home, condo, boat, townhouse, hotel, motel and bed and breakfast here is Southern NJ. Book your sitter online NOW!